The Republic of Ireland has the second highest incidence of BSE worldwide. Only a single case of vCJD has been identified to date. We estimate the total future number of clinical cases of vCJD using an established mathematical model, and based on infectivity of bovine tissue calculated from UK data and on the relative exposure to BSE contaminated meat. We estimate 1 future clinical case (95% CI 0 – 15) of vCJD in the Republic of Ireland. Irish exposure is from BSE infected indigenous beef products and from imported UK beef products. Additionally, 2.5% of the Irish population was exposed to UK beef through residing in the UK during the 'at-risk' period. The relative proportion of risk attributable to each of these three exposures individually is 2:2:1 respectively. The low numbers of future vCJD cases estimated in this study is reassuring for the Irish population and for other countries with a similar level of BSE exposure. Public faith in the worldwide scientific community suffered significantly after the announcement in 1996 that a new variant form of CJD was affecting the British public . This almost certainly arose as a consequence of eating BSE-infected beef [1–4]. Entry of an estimated 818,000 cattle into the human food chain in Great Britain [5, 6] gave rise to concern that a significant proportion of the population may have been exposed to contaminated material. Initial estimates of the potential size of any vCJD epidemic were hampered by lack of knowledge of both the incubation period distribution and the infectiousness of BSE-infected cattle to humans (the species barrier) . Uncertainties regarding these two key parameters resulted in very high initial estimates for the upper limit of any potential epidemic size . As the years progressed, and the exponential rise in cases was not seen, it became possible to reduce the estimates for upper limits of any potential epidemic from millions in 1998, to 136,000 in 2000 , to 7000 in 2002 . The most recent analysis of the data from vCJD deaths from the end of 2002 has shown that the epidemic in the UK has almost certainly peaked. This has further reduced upper limits for future cases in the UK to be no greater than 540 cases . Ireland has the second highest incidence of BSE worldwide . Concerns regarding a possible vCJD epidemic in Ireland have mirrored concerns in the UK, although any epidemic was always likely to be significantly lower as a consequence of the lower incidence of BSE. To date one case of vCJD has been confirmed in the Republic of Ireland . It is not possible to construct epidemic scenarios in the Republic of Ireland based on this case alone. However, since the epidemic in the UK appears to have peaked, it has allowed some key uncertainties to be determined with greater accuracy, namely, the infectiousness of bovines to humans and the incubation period distribution, by fitting an established and well described model to the UK data [7, 8]. Knowledge of these two key parameters, allows us to determine the risk to the Irish population once the relative rates of BSE exposure between Ireland and the UK have been established. The aim of this study is to estimate the future number of cases of vCJD in Ireland based on exposure to BSE-infected meat and meat products produced in Ireland, those imported to Ireland from the UK, and those consumed by Irish citizens whilst visiting the UK. Our analysis use established models which estimate the average number of vCJD cases arising from one infected bovine in the UK to translate the relative risk in the Republic of Ireland compared to the UK into estimates of future cases. Exposure of the Irish population to contaminated meat occurred chiefly via three separate routes, a) consumption of contaminated Irish meat in Ireland, b) consumption of contaminated UK meat imported to Ireland and c) consumption of contaminated UK meat by Irish people in the UK. There have been 1,224 positive BSE cases identified in Ireland (as of April 2003, ). The number of positive cases identified has been increasing in recent years, with 329 positive cases in 2002. This increase has been attributed to the BSE Targeted Active Surveillance Programme which began in 2000, and since Jan 2001, all cattle over 30 months for human consumption, all casualty animals, and all cattle greater than 24 months which die on farm (so called fallen stock) must be tested for BSE using a 'rapid test' approved by the Scientific Steering Committee of the European Commission. Over 1.5 million cattle have been tested in this manner since 2000. Estimates of the numbers of total BSE-infected animals infected in Ireland are based on results from a back-calculation model fit to the reported clinical cases . These estimates are directly comparable to the estimates of the number of BSE-infected cattle in the UK used to assess the risk of the vCJD epidemic in the UK [7–9]. 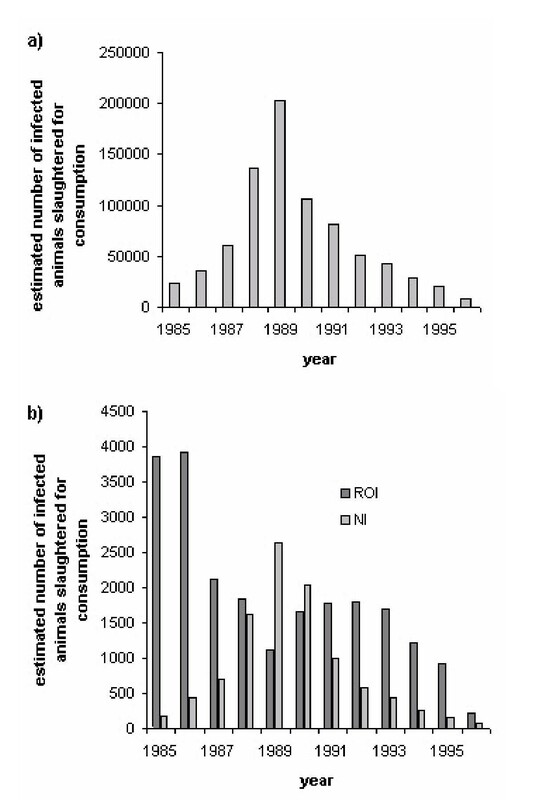 Figure 1 shows the estimated number of infected animals slaughtered for human consumption in Great Britain (GB), Northern Ireland (NI), and The Republic of Ireland between 1985 and 1996. Approximately 22,000 cattle were estimated to have been infected with BSE in Ireland over this period, compared to approximately 818,000 over the same period in GB and 9,500 in NI[6, 14, 15]. Our figures for total BSE cases in GB, NI and the Republic of Ireland are representative of the relative level of BSE exposure in Ireland compared to the UK, as all figures above were calculated using the same methodology. It is this relative level of exposure between the two countries that is used in our calculations. The total GB figure has been recalculated subsequently, and it is now estimated that 2 million cattle were infected in total in GB . This increase did not affect the estimates for vCJD epidemic size in the UK as the prediction methods fitted to observed vCJD mortality data, and not to the absolute magnitude of past human exposure to BSE-infected cattle . Due to the limited size of the domestic market, the Irish Beef Industry exports up to 90 per cent of its annual output . Only 10 per cent of domestically produced beef is therefore consumed in Ireland. Thus, 2,200 domestic BSE infected cattle 'equivalents' are estimated to have entered the food chain for consumption in Ireland. Data on beef imports were obtained from three sources; Customs and Excise in the UK, DEFRA in the UK and the Central Statistics Office in Ireland. These figures did not match precisely which may be as a result of different classification systems (table 1). We used the UK DEFRA & Customs and Excise figures, as this allowed us to estimate the proportion of UK-produced beef and beef products exported to Ireland, which was a parameter in the model. The UK exports approximately 20% of its total beef produced. It was estimated that 8% of all UK exports are sent to Ireland (table 2). Of this 35% is from GB and the remaining 65% from NI (table 1), which experienced a BSE epidemic approximately 1% the size of the epidemic in GB . This trade is complicated by a number of additional considerations. Firstly an estimated 50% of these imports are processed for subsequent export out of Ireland . And secondly, some of these imports are products that were initially sent over from Ireland to the UK for processing, or came from non-UK sources. The proportion of imports from the UK originating from non-UK sources was calculated by reviewing the export data from 1996 onwards following the export ban imposed on UK beef. This ban was modified in 1998, with a provision to export beef under specific conditions, but very little was felt to have actually taken place. The amount of UK beef imports identified during this time period (average 1439 tonnes/ yr 1997–2000), was therefore felt to be representative of the baseline level of non-UK beef as a proportion of total UK beef imported to Ireland (average 15,729 tonnes/ yr 1988–1995). Therefore approximately 9% of Irish imports from the UK were from non-UK scources. Of the remaining 91%, half was subsequently exported, leaving 45.5% of UK exports ultimately consumed in Ireland. Thus 45.5% of the 8% of total UK exports which make up 20% of total beef and beef products produced each year in the UK reach and are consumed in Ireland. Total BSE exports to the Republic of Ireland was therefore 0.26% of UK total (20%*8%*45.5%*(35% + (65%*1%)) = 0.26%). Assuming that 827 500 BSE infected cattle were slaughtered for consumption in the GB and NI, 2,148 'cattle equivalents' would have been exported and ultimately consumed in Ireland. These approximations do not take into account the timing of the SBO bans which were introduced in 1989 in the UK and 1996 in Ireland. They are taken into account in the mathematical model however. The Irish Blood Transfusion Service initiated a nationwide survey of both donors and the general public in 2000 and 2001 to estimate the proportion of the Irish population that had spent time in the UK during the 'at-risk' years 1980–1996 . The results are shown in figure 2. In total 3687 people were surveyed, 2684 donors and 1003 from the general population. Five percent of the Irish population spent five years or more in the UK during this time period. A further 5–6% spent between 6 months to 5 years during the same time frame, and a further 11% spending between 2–6 months. It was calculated therefore that 2.5% of the exposed Irish population (112,500) were present in the UK at any given time, and therefore were exposed to the UK risk. This represents approximately 0.16% of the UK risk (minus 20% exports) or 1082 'animal equivalents'. Time spent by Irish population in UK 1980 – 1996 (reproduced with permission from the Irish Blood Transfusion Board). 121 deaths due to vCJD had been diagnosed in the UK by the 31 December 2002 http://www.doh.gov.uk\cjd. The median age at onset of symptoms is 26 years, and at death 28 years. The excess of cases in younger individuals, compared with what would have been expected in a random sample of the population, suggests that younger individuals are either more susceptible to infection, were exposed to a greater extent, and/or have shorter incubation periods. All cases tested to date are methionine (MM) homozygous at codon 129 of the prion protein (PrP) gene . Approximately 40% of the Caucasian population share this genetic trait, with 13% valine homozygous and the remaining 47% heterozygous [20, 21]. Whilst it is possible that other genotypes are also susceptible to vCJD (and are either less susceptible than the MM genotype, or have longer incubation periods), at present we have no cases with which to constrain potential epidemic scenarios among these other genotypes. Our model predictions are therefore limited to the 40% of the known susceptible population with the MM genotype. We additionally assume that these populations are equally susceptible to infection. A recent analysis of the codon 129 status in Ireland has identified 34% of the population to be MM homozygous (n = 203). This did not differ significantly from the UK figure (Nurmi et al. unpublished). Preliminary results from testing appendix tissues for the presence of abnormal PrP in the UK showed 1 positive appendix in a sample of 8318 tissues . The majority of tissues tested (70%) were from the 20–29 age group (with the remaining tissues restricted to the 10–50 age-group), and all were removed between 1995 and 1999. The observation translates to an estimated detectable prevalence of 120 per million with 95% confidence interval 0.5–892 per million across the whole sample . We assume in our analyses that the positive appendix arose from an MM-homozygous individual. To obtain confidence intervals for the expected number of future cases of vCJD in the Republic of Ireland, we fit a survival model to the vCJD deaths recorded in the UK to the end of 2002.
and is used to calculate the transmission coefficient for Ireland (β IRL ) from the estimated parameter in the UK model (β UK ). where x 0(u,a) are the observed cases at time u and age a in the UK. For any model parameter, maximum likelihood confidence intervals are obtained using likelihood ratio tests. Non-linear optimisation techniques are used to fit the model (23) using custom-written code. An intensive search of parameter space was performed, fitting from multiple starting points and restricting parameter bounds, to ensure that the best-fitting models were obtained. Confidence intervals for the expected number of cases are obtained by re-parameterising the model so that the expected number of cases between times u 1 and u 2 in country i is a model parameter. Prediction intervals are obtained by adding Poisson variability to the confidence intervals on the mean. The expected prevalence in batch i is calculated from this expression as the average prevalence in the age-group over the period of time from which the samples were collected. The model fit is then judged by the combination of the Poisson likelihood fit to the cases and the likelihood fit to the prevalence data. As both the sensitivity and specificity of the diagnostic tests at different incubation stages are unknown, we include an additional parameter which specifies the proportion of the incubation period for which the test is assumed to be fully sensitive (working backwards from death), and assume that the test has no sensitivity prior to this time. We also assume the test is fully specific. Throughout we assume that the positive appendix is from an MM-homozygous individual, but that the 8318 tissues are representative of the general population (and hence 40% of these tissues are from MM-homozygous individuals), and that individuals will go on to develop disease. To fully characterize the exposure of any country to BSE-infected material, estimates of the numbers of infected cattle slaughtered in all BSE-affected countries are required. However, since the majority of BSE cases have been observed in the UK, we simplify the model to assume that the UK population was only exposed to BSE-infected cattle from the UK. In addition, we assume that the main exposure of the Irish population was to BSE-infected cattle from Ireland and the UK. Estimates of numbers of infected animals in the UK were obtained from previous analyses . Estimates of the numbers of infected animals in Ireland were obtained as detailed above. The effectiveness of the Specified Bovine Offal (SBO) ban in 1989 in the UK was assumed to be anywhere between 0 and 100% effective, with this parameter fitted in the model. A similar ban was implemented in the Republic of Ireland in 1996. We assumed that this ban was 100% effective. Survival patterns in the UK and the Republic of Ireland were estimated from census data. Other parameters for the model are described in detail elsewhere. The total risk from indigenous Irish cattle is estimated as 2,200 BSE-infected animals. Exposure from imported beef is estimated to be approximately 2148 animals. Exposure translated into numbers of infected bovines for those traveling to the UK is estimated to be approximately 1082 infected animal equivalents. The relative attributable risk is therefore approximately 2:2:1 for exposure from Irish risk from Irish BSE, risk from imported BSE from the UK and exposure of the Irish population in the UK respectively. The total estimated exposure is 5430 infected animal equivalents. The relative BSE exposure in Ireland compared to the UK is given by the ratio of the exposures in the two countries (= 5430 / (818000 + 9500) * 0.8) and is hence estimated to be 0.8%. A simple estimate of the future number of cases of vCJD in Ireland is therefore given by multiplying this risk by the estimated future number of cases in the UK. By adjusting for differences in the exposed population size, the individual risk that an Irish person has relative to someone of similar age with similar beef consumption in the UK is estimated to be 13% (relative BSE exposure (= 0.8%) * exposed population differences (= 68,800,000/4,500,000 = 15.3) = 13%). Table 3 shows the estimated future cases of vCJD in Ireland and their 95% confidence intervals. Our results indicate that we should expect very few (1–2) further future clinical cases of vCJD in Ireland. In the model fit to the vCJD case data alone, the uncertainty in this estimate is relatively reassuring with an upper bound of 15 future cases. However, in the model fit additionally to the prevalence data from the UK study of appendixes, the uncertainty in this estimate is greater. This uncertainty is due to the wide range of prevalence estimates in the UK consistent with the results in the appendix survey. Estimate of the future incidence of vCJD (2003–2080) compared to the UK. Mean and 95% confidence intervals in brackets. A best estimate of between 1 and 2 future clinical cases of vCJD countrywide is somewhat reassuring for the Irish population. However, there are some limitations to the analysis used in deriving this prediction. Firstly, all vCJD patients to date have been homozygous for methionine (MM) on codon 129 on the PRNP gene. This represents approximately 40% of the Irish and UK population. It is assumed in this analysis that the remaining 60% of the population are not susceptible. However, in patients with Kuru, those with different polymorphisms also developed the disease, but with a more prolonged incubation period . It is also possible that this may be the case with vCJD, however, this can only occur if these genotypes have a longer incubation period or a decreased susceptibility. These scenarios would both result in a lower per-capita incidence of infection in people of this genotype. Secondly, this analysis assumes that the vCJD cases in the UK were infected through consumption of BSE-infected beef. Meat and bone meal, which was felt to be the source of the BSE epidemic in cattle, was banned from the diet of ruminants in 1988 in the UK and 1990 in Ireland. However, meat and bone meal was fed to other animals in Ireland until 2001, when an EU directive prohibited its use in all animals intended for human consumption. While there is no clear evidence that vCJD may be contracted from other animals, it needs to be kept in mind that meat and bone meal may have been fed to animals that entered the human food chain in Ireland until 2001. It would be inappropriate to assume that this certainly represents no risk to human health. If so, any vCJD 'epidemic' may not follow the pattern of the BSE epidemic precisely. Our model estimates the total future number of 'clinical' cases. However, it is not possible to estimate the number of people who may be 'subclinical carriers' of the disease. It is known that the infecting 'prion' proliferates in the lymphoreticular tissue of the GIT, prior to neuroinvasion. There is also concern that the disease may be present in blood during the subclinical phase of the disease . It is unknown how many of these patients who carry the disease in this manner will eventually develop clinical symptoms and die of their disease. Considering the number of people exposed to infected material, the possibility that there may be a large number of people with subclinical disease cannot be discounted. While these patients may suffer no adverse effects themselves, they retain the possibility of transmitting the disease to others, as a result of iatrogenic transmission from surgical procedures, such as tonsillectomy or appendicectomy, or as a result of blood transfusion or receipt of blood products. The only estimate of the prevalence of asymptomatic infection to date is from a retrospective study of appendicectomies in the UK, in which PrPsc was detected in a single appendix specimen out of 8318 asymptomatic patients, giving a subclinical detectable prevalence of 120 cases per million in the UK . The confidence intervals, however, for this study were wide (0.5–892 cases / million). Fitting this prevalence data to the model increases the upper bound on the future number of vCJD cases in Ireland from 15 to 46, assuming that a patient with PrPsc identified in their appendix will ultimately develop clinical disease. The wide confidence intervals for the prevalence study on which these figures are based , suggests that these estimates should be interpreted cautiously. To ensure that we are identifying all vCJD cases, and also to ensure that the disease is not entering the human population by a more surreptitious route (eg via different animals, different strain of prion), it is of considerable importance that the Irish CJD Surveillance Unit continue to be notified of all possible cases of TSEs. This will allow cases of vCJD to be picked up and correctly identified. It will also ensure that other types of prion diseases are within established normal limits. In Switzerland, the level of sporadic CJD in 2001 was 2.5 times higher than expected . This has given rise to the suspicion that perhaps they may be contracting a different form of BSE, or that the disease may be entering the human population from a different route. Support for this point of view has been strengthened by a recent study in which mice inoculated with BSE developed neuropathology sometimes indistinguishable from sCJD . The relative contribution of risk from indigenous Irish risk from Irish BSE: risk from UK BSE imported to Ireland : risk from Irish population in UK during at risk period is 2:2:1. Currently the Irish Blood Transfusion Service (IBTS) has banned donors who have spent 5 years or more in the UK during the 'at-risk' period 1980–1996. This study indicates that even if all potential donors who spent more than 2 months in the UK were banned from donating blood, it would still only represent 20% of the total vCJD risk. Our estimate of 0–15 future clinical cases of vCJD suggests that the risk to our blood stores is not as high as was previously feared. However, this estimate increases to 0–46 cases when we use the subclinical study from the UK. We cannot outrule the possibility that there may be an even larger number of people that are subclinical carriers of the disease, that could still potentially transmit the disease via blood products. Attempts to establish a nationwide subclinical prevalence study by assessing tonsil tissue for PrPres in Ireland have been slowed as a result of ethical concerns regarding anonymous testing for a fatal disease with a long incubation period. Our results strongly suggest that the likelihood of identifying a positive sample would be quite small, and a large numbers of tonsil specimens would be required to ensure that the study would be statistically robust. The development of a suitable blood test that would allow screening of large numbers of the population would prove extremely valuable in further quantifying the risk to the Irish population to vCJD. We estimate that there will be a small number of future clinical cases of vCJD in Ireland as a consequence of primary exposure to BSE contaminated material. This is reassuring for the Irish population and to other countries that have had a similar level of BSE exposure. We would like to thank the Irish and UK Departments of Health for co-funding this study. The views expressed in this publication are those of the authors and not necessarily those of the Department of Health.